Networking is often described as the most important factor in getting a job, landing a promotion or even holding on to a desirable position. Yet, people often hear the term and think it means they must attend functions where they must introduce themselves and hand out business cards, and ask strangers for job leads. If that’s what you are thinking, think again. Networking has evolved into a process of building solid professional relationships that involve exchanging communication, ideas and information. It’s about creating ongoing dialogue with peers, associates, individuals in positions you may aspire to, and those with knowledge and insight into your profession – or a profession in which you may have interest. Online sources: Sites such as LinkedIn offer effective ways to get in touch with people with whom you have worked or know on a more casual or social basis. They, in turn, may be able to introduce you to other people you’d like to get to know. It pays to do more than just “connect” in these online groups. Take some time to learn how to use and leverage resources on the sites. Career and leads groups: In many locations, you’ll find groups that exist to share job leads and opportunities. Beyond finding out about specific positions, these groups can help you get a better idea of what organizations are hiring in your area. They also can be excellent sources of tips and advice on how to improve your presence in other networking situations, online and off. Professional groups: Almost every profession has an association or informal group, online or off, to further education and connections within the field. Do some research to identify the ones that best meet your goals, and become active in those. Community organizations: Whether it’s a neighborhood association, church committee, volunteer opportunity, hiking group or your Spanish language class, you often can effectively expand your network close to home. General business groups, such as Toastmasters and the local Better Business Bureau, can also be good resources. Networking is far less intimidating when you realize it’s really not all about you. Take the approach of learning something interesting about others. Start by asking questions about the person with whom you are talking. Learn about his or her business, career path and interests outside the workplace. Even in social situations, good conversation can easily include the chance to ask someone about what they do in their work and about their company. Learn by listening – carefully. A good two-way conversation will almost always lead into the other person taking an interest in what you do and what you’d like to do. As you expand your network, you’ll find that you will continue to meet more people and make more connections, receive valuable career advice and learn of job opportunities – often before those positions are openly posted. This means you can come to a company through a referral, which can be positive for both you and your referral source. Through developing a network, you’ll likely learn about companies and organizations – of all sizes and types – whose names you may not immediately recognize, but that could open the door to new opportunities. You’ll gain input on interview preparation and may meet important role models and mentors. Remember, too, that networking is not just a one-time activity to do while job-hunting. Developing a professional network is an ongoing activity throughout your career that will help you improve the quality of your work and increase job satisfaction. Understanding the benefits networking accrues to employers also can help you understand the benefits of career-long networking. Companies frequently fill jobs through trusted referrals, without posting the positions. They frequently find that referral employees are better performers, and create more engagement in the business when hired. Employees hired through referrals typically have longer retention periods. Many human resource executives consider referrals the “secret weapons” in building performance-driven organizations. It may be time to update your definition of networking, and view the process as an ongoing way to meet and learn from new, interesting people. You will find doors opening to opportunities that very well might otherwise stay closed. No doubt about it. 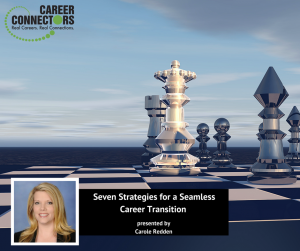 Losing a job– being in career transition—takes its place right up there with some of life’s most difficult challenges. At times it can feel like it’s literally sucking the breath from you. But it helps to realize that others, having traveled this particular part of the storm, have not only lived to tell about it, but have come through this particular storm stronger and ready to tell their story. And ready to share what they’ve learned. Like the airplane, they’ve taken off against the wind. Consider the message from the Broadway musical Wicked, Defying Gravity: “It’s time to try defying gravity. I think I’ll try defying gravity. And you can’t bring me down” as you consider our keynote’s personal story and her advice. Naomi Buckta has been in your shoes. She feels your pain. She, too, has experienced job loss. The good news is she came out stronger on the other side and shares her tips for getting through the storm. Today she’s Vice President of sales & marketing for four related companies. Through her experiences she’s conducted seminars and workshops focusing on personal transition and social networking. 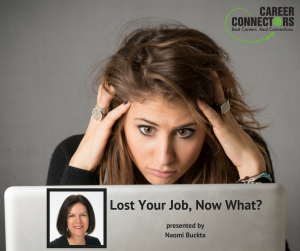 Lost your job? Don’t panic. When you start to doubt yourself, make a list of your strengths. Go to your LinkedIn profile and read the great stuff people have written about you. When Naomi Buckta was laid off in 2010, it caught her off guard even though she was part of the executive team. She had to remind herself what a rock star she is. Assess yourself. Clean up your social profiles. Know what you really want and let your resume reflect that. Consider a career coach. And a mentor. Don’t be resentful. Develop the habit of writing thank you notes. Don’t burn bridges. Stay current in your field. This is the number one reason people lost their jobs in their organizations. Remember MOOCs. Say, what? You know MOOC–Massive Open Online Course. It’s those courses of study available on the internet and available without charge to large numbers of people. Make a section on your resume to document ones you’ve taken. It’s one more sign to potential employers that you’re staying current in your field. Have a plan—Connect with people through NetworkingPhoenix.com, LinkedIn groups, church groups. Find out who knows who. Prepare your elevator speech. Build your network whether you’re in job search or gainfully employed. Relationships matter. What do you know, what are your targeted companies, and what networking events are available to you? Find a mentor who among other things will be honest with you and even help you debrief after an interview. Your resume—don’t sound like a zombie—aim to make your resume sound like a human voice. Make sure your resume reflects the exact job you’re looking for now. Put it on quality paper. Is your portfolio up to date? Consider writing a 30/60/90 day plan and aim to work it into an interview. The interview—Prepare questions to ask for every level of the organization. And be prepared to answer behavioral questions. Speak positively about the company you just left NO MATTER WHAT. Make your own opportunities while going through job transition. Consider contract work, consulting, teaching a class, working part-time to make ends meet. Or do something you’ve always wanted to do but never took time like planting an herb garden, organizing family photos, and taking a picnic lunch to the park. Naomi summed up her thoughts, expressed in a quote, about getting through tough times like a job loss and career search. Our finest moments are most likely to occur when we are feeling deeply uncomfortable, unhappy or unfulfilled. For it is only in such moments, propelled by our discomfort, that we are likely to step out of our ruts and start searching for different ways or truer answers. Northcentral University, regionally accredited, features online education at a higher degree including degrees in education, technology, business, psychology, and marriage & family science. Online degree programs allow students to learn in a one-to-one learning model from a 100% doctoral faculty. One of the benefits includes free education. Currently they are hiring for academics, administration, enrollment, information technology and student support services. AB Staffing Solutions, a staffing and recruiting agency, is one of the fastest growing companies in the healthcare industry. They provide healthcare personnel at government and commercial medical facilities across the country. Their company is casual, attracting employees who gladly roll up their sleeves to get the job done and who are not afraid to talk to people. AB Staffing hires medical staff for three to six month contracts, sometimes with the opportunity for permanent placement. For more information or to apply, check their website or call. Many opportunities for healthcare workers, including recruiters, nurses, and doctors, are available in Arizona, Texas, New Mexico, and California. Vanguard, a large client-owned investment company founded in 1975, is one of the world’s largest investment management companies, with 17 locations worldwide. Unique in its industry, as a client-owned company, they have no outside owners seeking profits. A stable company, they’ve had only three CEOs over their 42 years, with their fourth CEO Tim Buckley slated to become new CEO in January, 2018. The company stresses integrity, a 37 ½ hour workday, and community service. Perks or benefits include 18 days paid time off, 9 paid holidays; up to 4 ½% 401K; onsite gym, dry cleaning, and wellness; health, dental, and vision benefits starting the first day; intramural sports leagues and more. Currently the company offers positions ranging from entry level to management, including client relationship specialist, processing associates, financial advisors, compliance manager, and team leader roles. For more opportunities or to apply, visit their website. Coder Camps provides web development opportunities in data science. Increasing demand for this relatively new field of data science means there’s an ever-increasing demand for specialists who help companies make business decisions using the data. There’s no entrance exam for the school. Instead, recruiters sit down and talk with potential students one-on-one. Coder camps take students where they are. The emphasis is training for developing projects—which is how students will get a job. Employers want to see their coders know how to develop projects. Universities these days connect with coder camps because the coder camps can keep up with the rapid changes inherent in web development. Coder Camps are Coders for Life meaning since technology changes so fast, the school allows graduates of the coder camps to come back over and over at no additional cost. Coder Camps offer ongoing training and job placement for life. Upcoming events include a free introduction, so contact the school to sign up for a free intro Wednesday, October 18, 2017, from 5—7PM. And on Friday, October 20, 2017, from noon-3PM please visit their big Demo Day. For more information on applying or signing up for their events, visit their website or call. Executive Director of Career Connectors Jessica Pierce closed the formal part of the meeting and introduced breakout sessions. The breakout sessions include the opportunity to speak directly with hiring managers, LinkedIn and resume specialists, financial consultants, coaches, educational specialists, and a professional photographer for free business head shots. Jessica thanked volunteers and our host facility Highlands Church. The next Career Connectors event is the Glendale launch, featuring Glendale Mayor Jerry Weiers, on Thursday, October 19, 2017, at 9AM at Calvary Church at 59th Avenue and Bell in Glendale. Topic of the keynote address will be You’ve Got This! : Real, No-Nonsense Ideas for Mentally Regrouping After a Layoff presented by Bridgett McGowen-Hawkins. The Glendale location will be held the third Thursday of each month. The next meeting for the Scottsdale event will be Thursday, November 9, 2017, at 9 AM and features keynote speaker Cary Pfeffer on the topic of Telling Your Story. To find specific location details, visit the events section of this website to register for any or all of the four locations. “Always wear cute pajamas as you never know who you’ll meet in your dreams” — not sure who said that first — but I kind of wish I’d thought to coin the phrase. Anyway, the topic is careers, so obviously you won’t see anyone on the job or at a job fair wearing slippers and pajamas except in a Dilbert comic strip. I’m thinking of all those celebrities, pictured looking drowsy because they stepped out for some mundane reason. Most of us, fortunately, can still take an ordinary trip to fill up the car with gas or buy groceries without being judged like a celebrity. We’re still not recommending hair curlers (does anyone even use those these days?) or fluffy slippers, though. Dressing the part, while important in the job search, is only one important part of showing up prepared for a job fair, says keynote speaker Andy Ridley. Andy coaches individuals, groups and corporations towards reaching their goals and Becoming Ideal. He’s also trainer for Arizona@Work, Maricopa County (Formerly Workforce Connections). Andy transitioned into his current career after spending many years in education. But his most lucrative job got its start indirectly via a job fair. 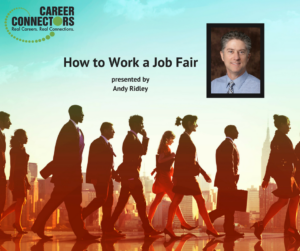 He had applied for a job in a nearby school district, but imagine his surprise when someone at the job fair said, “You’re THE Andy Ridley?” Months before he’d applied for a job but hadn’t even received an interview. But for some reason that application gave him name recognition. Voila. One of Andy’s most important pieces of advice—you never know who you might meet at a job fair. To Learn — What jobs are available, hours, what is the job, who is the employer, who else is looking for work? 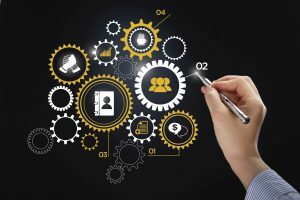 To Meet – What employers are there? Meet them or their representatives. Meet other job seekers. To Impress – Dress appropriately, and shake hands by matching the other person’s grip, leaving a good impression. Based on his years of experience, Andy tells us to have a game plan but to remain flexible. Be proactive. Find out who’s attending — what employers will be there? Create a short list of booths to visit. Research your short list (Make your prep notes right on your short list). Get to the event early, before it even starts (you can probably leave early when everyone starts packing up to go home). Have a resume and several copies even though most companies won’t take a paper copy. Use sticky notes to separate the resumes according to various skills for various job opportunities. Be prepared with questions to ask recruiters. Dress as a professional. Andy suggests dressing one step above the position you want. To allow yourself to shake hands and not be weighted down, carry a notebook-size portfolio—make it serve as your wallet. In the wallet keep several type business cards that highlight your best qualifications, your name and contact information. Vistaprint offers affordable cards online. Put your car keys in there, too. Pass up the bags and chip clips they might give out. It bogs you down. Concentrate on meeting people so you can get a job and buy your own chip clips! Briefly introduce yourself (elevator speech). Tell them your name last (or first and last). Offer a copy of your resume. Shake hands, matching their grip. Market yourself. Be positive. No negativity. Limit time at each booth. Walk away from booths if you know you will not be interested in working there. Introduce yourself to other candidates and to a booth rep that you feel may benefit from knowing the job seeker. It gives you another opportunity to present yourself to the company. Carry blank thank you cards. Return later and offer the card with another hand shake. Put your name/contact information/ and thank them for their time. Go home and email the best prospects. Remember every meeting and connection is a form of an interview. And your day was a success if you met one new connection. You win if you go because you’re bound to learn at least one new thing, meet at least one new person and possibly impress one contact. Discover offers credit cards, consumer banking, and a global network. Their mission? To help people spend smarter, manage debt better and save more so they achieve a brighter financial future. Located at approximately 101 and I-17 (2402 W Beardsley Rd, Phoenix, AZ 85027), the company currently employs 3000 people and has 200 job openings including home equity-loan processors, bankers; full time customer service agents; full time collections agents; consumer lending and banking operations including personal loan agents, student loan agents, and deposit product agents; and full time fraud agents. Benefits are included Day 1 including 401ak, fitness center, cafe, parking, and tuition assistance up to $5000 per year. To learn more about the company or to apply, visit their website. VIXXO, a full-service asset management and maintenance solutions company employs 1000 associates across the US and Canada, and serves brands including Starbucks, PetSmart, and 7-Eleven. It’s been named INC 500 Fastest-Growing Private Companies for over eight years. A team of doers, the company’s strength lies in their diverse backgrounds and experiences, thriving in a fast-paced and dynamic environment. Open positions include director of product development, director of software engineering, lead generation specialist, senior accountant, coffee technician, customer service representatives, change management consultant, and data warehouse developer. For more information or to apply, go to their website. Express Employment Professionals is a locally-owned and operated staffing company located in Tempe. The top three benefits of the company include job resources, flexibility, immediate eligibility for medical benefits including medical, dental, vision, short term disability, life insurance and holiday and vacation pay. The company, a member of both the Tempe and Mesa Chambers of Commerce, provides skills assessment, connections to local employers, and proactive marketing of candidates. A one stop shop, they offer resume review, interview advice and wage negotiations. Positions open include part-time, full-time and contract work. Current openings include staff accountant, full charge bookkeeper, customer account supervisor, bilingual Spanish content editor, Special Education Teacher (Casa Grande), art process technician, P&C licensed sales rep and CSR, enrolled agent/office manager (Cave Creek), CPA/Tax Reviewer. Internal at local Express Office needs outside sales/business developer; bilingual front office coordinator; and part-time contract recruiter. For more information, check out their website. Goodwill of Central Arizona is a non-profit organization working as a positive catalyst for eliminating unemployment. They also transform gently used donated goods into services to help thousands of Arizonans. They provide on-site career development via Goodwill Career Centers and connect local talent with Valley employers including Prescott and Yuma. Serving the community, Goodwill partners with employers and collaborates with community resources. Goodwill provides career coaching, resume critiquing, and mock interviewing. They provide on-site services. You may connect with them through employment events, talent sourcing and Goodwill Job Board. In holding job fairs, Goodwill is more interested in quality than quantity – They like to match what job seekers are looking for with what companies need. To learn more about Goodwill, and details of what they offer, visit their website. Closing the formal part of the meeting, Sheila Coulam, Director of Operations for Career Connectors, thanked everyone, including volunteers and our host, Highlands Church. She reminded everyone of the Career Connectors website which has lots of resources such as the new career advice blog which includes a blog on how to transition from the military to civilian jobs. Sheila pointed out the resources on hand after the formal meeting — the opportunity to talk with hiring companies, to consult with LinkedIn and resume preparation experts, and to meet the professional photographer to take free business heat shots. She pointed out that the next Scottsdale meeting is the third Thursday of the month in March , March 16 (NOT the usual second Thursday). For other upcoming Career Connectors events, more details, and to register, click here.